Geared toward athletes of every kind, from world-class professionals to weekend joggers. The particulars of the sports massage technique are specific to the athletes sport of choice. Focusing on areas of the body that are overused and stressed from repetitive and often aggressive movements. 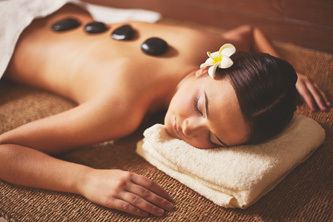 A natural therapy in which warmed stones are positioned on parts of the client body to maximize the therapeutic benefit. The stones used are typically river rocks or other very smooth surfaced stones made of basalt. The stones are heated and sanitizing water before use. The high iron content in basalt helps the stones retain heat during the massage. 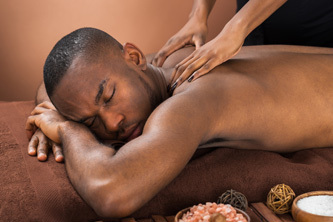 Hot stone massages are beneficial on both physical and psychological levels. Over time, the body builds up unhealthy amounts of stress hormones in response to work deadlines, traffic jams, relationship problems and more. These hormones can cause physical problems, like digestive issues, headaches and sleeplessness. Relaxation massage decreases the amount of stress hormones in the body, leaving Client feeling completely relaxed and rested, even after the session is over. A massage technique that focuses on the deeper layers of muscle tissue. It aims to release the chronic patterns of tension in the body through slow strokes and deep finger pressure on the contracted areas, either following or going across the fibers of the muscles, tendons and fashion.